Puppies know that they're being cute. They're using you. We don't sound anything like those silly voices you use to imitate us. We'd be lost without you. We love you. 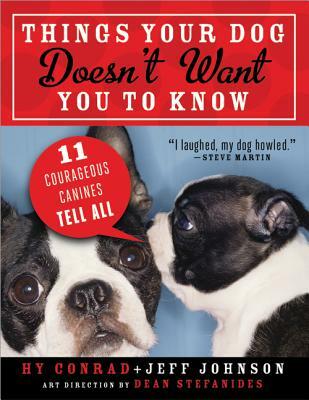 It's all in our new book, Things Your Dog Doesn't Want You To Know, as told to humans Hy Conrad and Jeff Johnson. Even Steve Martin (yes, THAT Steve Martin) raves about us Inside you'll find revelations such as the reason we at the sofa (leather tastes very similar to rawhide), and what we really think of the costumes you dress us up in. I'm not alone. Ten other courageous canines have stepped forward to tell you what your dog won't - every last dirty, hairy bit of it. If you have dogs, love dogs, or have ever been baffled by a dog, this book is a must-have.